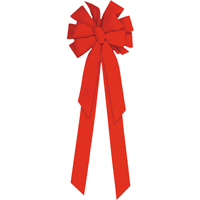 2 3/8 inch wide ribbon with 12 inch bow diameter. 10 loops, 28 inch tails. 6 per case, $4.50 each.